Other Common Names: American cranesbill, spotted cranesbill, spotted geranium, alumroot, alum bloom, wild geranium, storksbill, chocolate flower, crowfoot, flekkstorkenebb (Norwegian), Amerikansk storkenæb (Danish). Habitat: Cranesbill is indigenous to the eastern and central North America. It is mostly found growing wild in woods and forests. Plant Description: Cranesbill is a perennial plant from the genus Geranium and belongs to the Geraniaceae family. 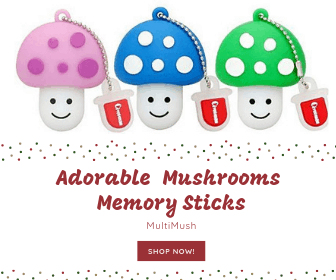 It can grow up to 60 cm (around two feet) in height and has deeply lobed toothed leaves. The flowers have five petals and are pink or purple but white flower varieties of the species occur. The fruit resembles the beak of a crane which explains the English common name cranesbill. Plant Parts Used: It is primarily the roots or the underground plant stems (rhizomes) of the plant that are used in herbal medicine but sometimes the above-ground parts are used. The root should be harvested in the early spring while the aerial parts should be collected in the summer. Some of the substances found in cranesbill are tannins, gallic acid, starch, pectin, and resin. The root can contain between 12 to 25 percent tannin, with the highest amount just before flowering. 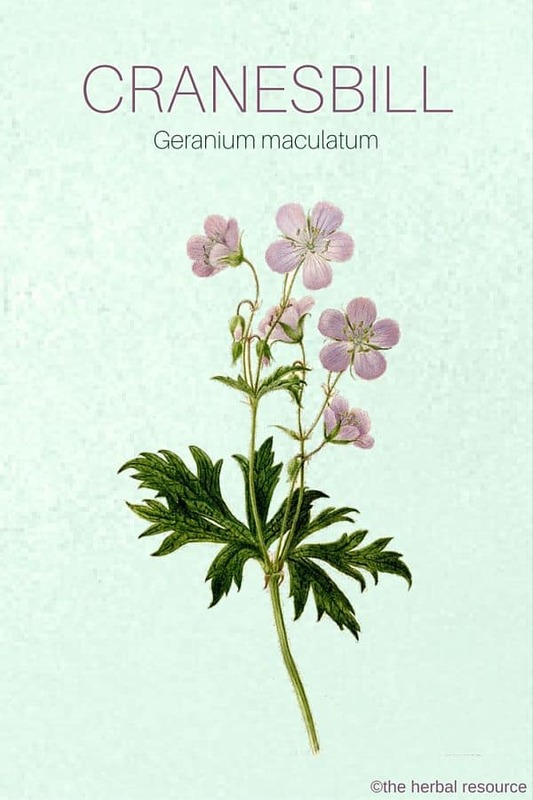 The American cranesbill is not the only plant of the genus Geranium that is used in herbal medicine. The European species wood cranesbill (Geranium sylvaticum) and herb Robert (Geranium robertianum) are also used. The early Native Americans used this herb to treat many medical conditions including dysentery and diarrhea. It was used as an eyewash and the powdered root, often mixed with other herbs, was used as a compress on wounds and swollen feet. The Ojibwe or Chippewa used the dried and powdered roots (rhizomes) to remedy mouth ulcers, inflamed gums and sore throat. The Blackfoot tribe employed it to stop hemorrhages. The plant was later used by the European settlers in North America for diarrhea, internal bleeding, cholera and sexually transmitted diseases. Due to the high tannin content the herb it has both astringent and antiseptic properties. Today’s herbal medicine employs the herb for irritable bowel syndrome (IBS), diarrhea (especially in children and the elderly), dysentery, gastro-intestinal catarrh, ulcers, colitis as well as hemorrhoids. 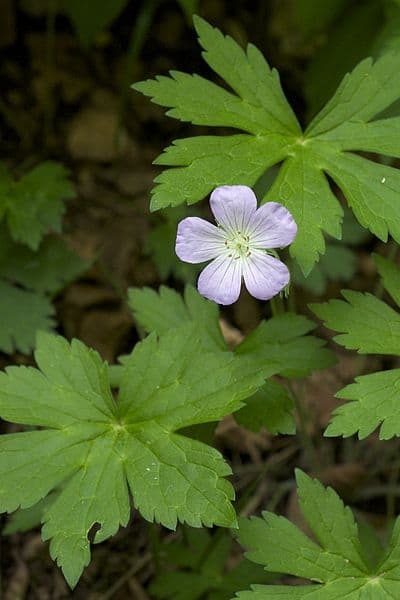 Cranesbill possesses hemostatic properties and can work as an agent to stop internal hemorrhages. In addition, the herb is used for hemoptysis (expelling blood or bloody mucus), hematuria (presence of blood in urine) and heavy menstrual bleeding and externally to stop bleeding and heal wounds. As a mouthwash or gargle, the herb can be effective against thrush, inflammation of the mouth and throat, tonsillitis and toothaches. 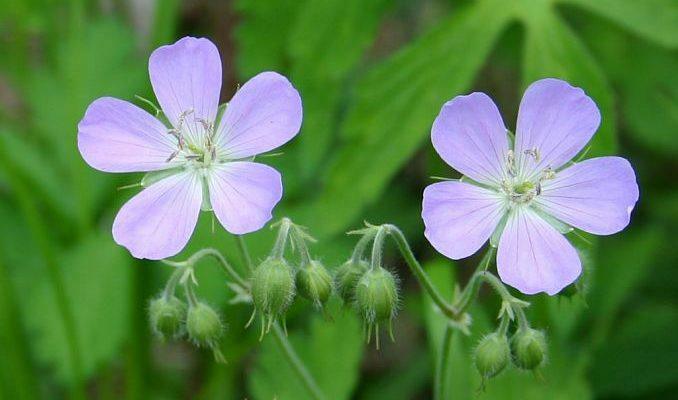 It has been found that cranesbill is very active against the bacteria that cause tuberculosis. Both the flowers and leaves are edible but are sour or bitter in taste. The flowers are often used as a garnish. Cranesbill leaves and rhizome is available commercially in dried, tea or tincture extract form. Tincture – 2 ml to 4 ml in a glass of water taken three times a day. Decoction – one or two teaspoons of the dried rhizome in a cup of cold water and bring the mixture to boil. Simmer the mixture for ten to fifteen minutes and then allow the mixture to cool down before filter it. Cranesbill is considered a safe herb to use, but normal precautions should be taken with the herb as with all other herbs. Hoffmann, David: Healthy Digestion. Dublin, Ireland. Newleaf 2001. Hoffmann, David: The New Holistic Herbal. Boston. Element Books Ltd. 1990. Elias, Jason & Shelagh Ryan Masline: The A to Z Guide to Healing Herbal Remedies. New York. Dell Publishing 1995.